"The active principle of everything is Krsna, and highly elevated transcendentalists see everything in connection with Him. In the Caitanya-caritamrta it is stated that a maha-bhagavata, or highly advanced devotee, sees Krsna as the active principle in all movable and immovable living entities. Therefore he sees everything within this cosmic manifestation in relation to Krsna. For the fortunate person who has taken shelter of Krsna as everything, liberation is already there. He is no longer in the material world. This is also confirmed in the Bhagavad-gita: Whoever is engaged in the devotional service of Krsna is already on the brahma-bhuta or spiritual platform. The very name Krsna suggests piety and liberation. 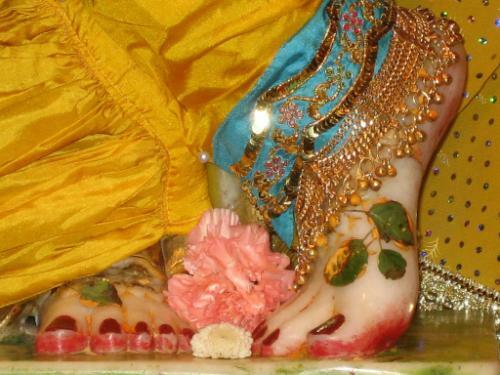 Anyone who takes shelter of the lotus feet of Krsna enters the boat for crossing over the ocean of nescience. For him, this vast expansion of the material manifestation becomes as insignificant as a hoofprint. Krsna is the center of all great souls, and He is the shelter of the material worlds."